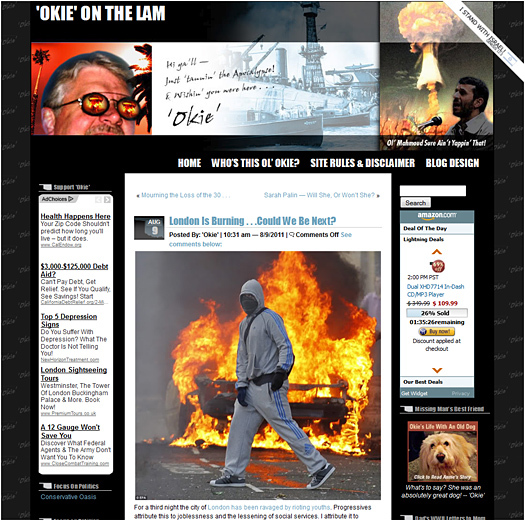 The Kitchen Cabinet.US — Back to WordPress! As one can see from the number of versions of The Kitchen Cabinet website presented here … we’ve been working on it for a good long time. In fact, it’s going to go through another transition in the very near future as we gear it up for the 2012 Presidential Election. Relaunched last spring and transitioned back to the WordPress CMS from the fall of 2010’s experiment with the n2 CMS on Microsoft server, once again we are back among the tens of thousands of plugin developers who continually add function and FUN to this powerfull CMS software. Thanks WordPress! 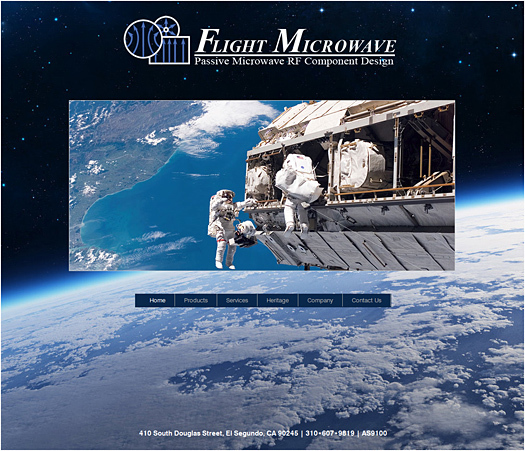 Flight Microwave Corporation designs and manufactures “Passive Microwave RF Components” used in communication satellites along with other antenna products and also performs high-level performance and environmental testing for both in-house and client requirements. Every once in awhile one just has to do something personal. 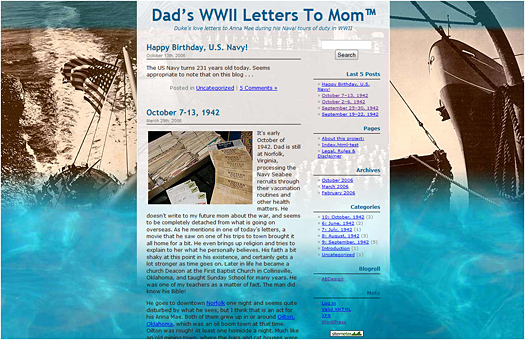 This is mine: Dad’s WWII Letters To Mom website. It most definitely is a work in progress and I have only just begun the job of transcribing the over 400 letters and postcards that he sent to her. A real journey of discovery I’ll tell you — Oh, ya betcha! The all new conservative women’s organization site, TheKitchenCabinet.US was launched this August 17th. Their campaign is to mobilize 100,000 women to bring 10 friends each to the polls to deliver one-million conservative votes in November. Unlike previous versions of the Cabinet, this site is built on the N2 CMS system created for the .net aspx file systems running on MicroSoft servers. Arthur Baker Design is providing creative and webmaster support for this site. True North News & Commentary is a conservative news and information portal for those of similar persuasions. Visit it often for the commentary of Lowell and Sonja Eddings Brown plus great videos, stills and links to the major conservative sites and blogs. Arthur Baker Design was privileged to develop this site for the Browns with customized versions of the WordPress VodPod widget, Featurific and incoming RSS feeds, as well as incorporation of the Cincopa image/audio/video service. 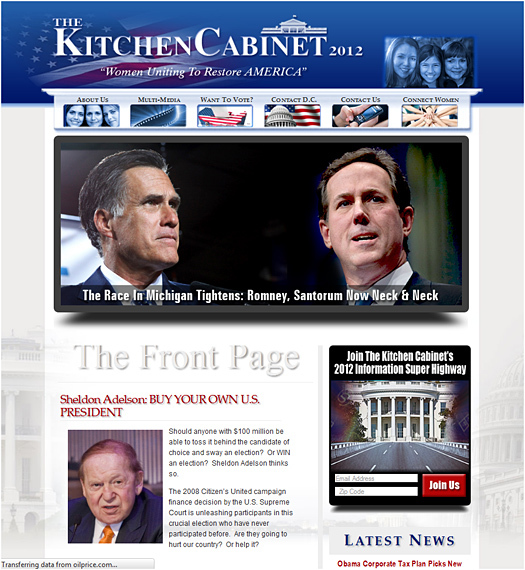 Launching today, November 17th, 2009, The Kitchen Cabinet PAC is the supporting website for the recently created Conservative Womens’ Political Action Committee of the same name. 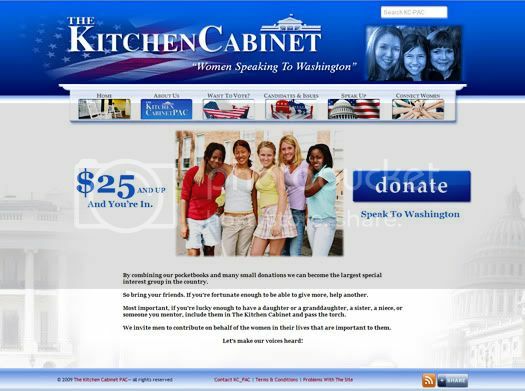 Designed to help give a strong voice to women throughout the US and its territories, commonwealths and military facilities all over the globe, The Kitchen Cabinet PAC features educational articles, contact information for The White House, Senate and House of Representatives and will soon offer a user-supplied nationwide directory of political and service organizations. Arthur Baker Design worked with the PAC’s creator Sonja Eddings Brown to provide a rich user experience via the power of the WordPress engine as the CMS. The donation element of the site is from Blue Swarm. If you are of like mind, or just want to gain insight into the realm of conservative politics — take a peek. ABDesign — that’s shorthand for Arthur Baker Design, which is indeed a mouthful! This blog is going to be a standin for my online portfolio as well as allow me a venue for making comments and criticisms about the state of design in general. While the changeover is in progress the next few weeks, please access the old site via this link. Actually, in a time that now seems far, far away, I studied Transportation Design at the Art Center College of Design in Pasadena. I have always loved automobiles, and much of my professional design career has been spent within the automotive aftermarket community, including custom wheels and eCommerce site development for automotive accessory vendors. Lately we’ve dived head first into the blogging world resulting in this particular WordPress installation as well as personal blogs and blogs for clients, all of which will be featured for your perusal and comment. So, please enjoy your look around our world, and if we can help you with any of your design project needs, contact us at “info (@) arthurbakerdesign (dot) com”.